It's New Years Day, the holiday season is officially over, and it's time to get back to building! Actually, I've never stopped, but for the last month or two I've been working on top secret Christmas gifts, which I couldn't blog about, for the obvious reason. But now that the holidays are over, I can catch up on all the interesting projects that have been going on around here. Well, I think they are interesting, anyway. I'll start with the very last project I finished -- something I knocked together in the last day or two. All the other projects I've been working on have involved the use of a table saw -- one of the tools I'm least comfortable using. My current table saw is one I was given, so I can't complain much about it, but it is fairly small and rudimentary. Two things it sorely lacked were a sturdy stand and an out feed table. I thought about buying both, but then I thought, why buy things when you can build them? The out feed table was the easy part. Since I don't have room to store an actual table, I reasoned that a piece of 3/4" plywood clamped onto some saw horses would make a fabulous out feed table. I could vary the size as needed, and store the whole thing away when it's not wanted. Problem #1 solved. Once the height of the out feed table was fixed, it was a simple matter to subtract the height of the table saw, and to build a stout little base to make up the difference. You can see from the photo above that it's a simple little thing, made from scrap 2x4s and 1x4s, with some 3/4" MDO plywood for the top. The MDO was make from off cuts from my bulkhead project. I didn't have a large enough scrap for the whole top, so I used two scraps! I originally planned to bolt the saw to the top of the base, but then I realized there would be no place for the sawdust to go, so instead of bolting it down, I attached a rail to the base's front edge. 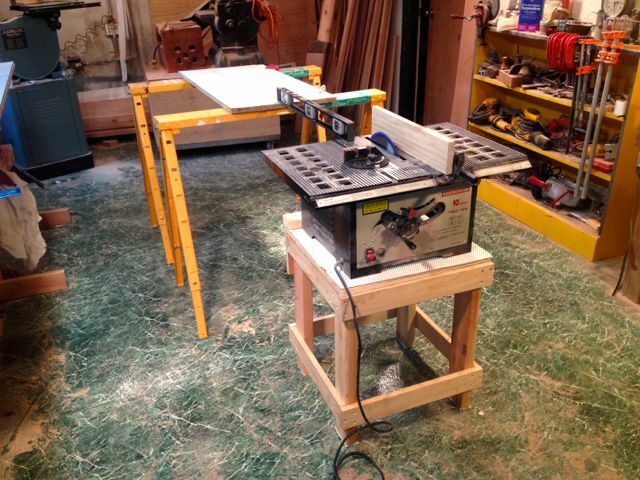 Rail to keep table saw from sliding forward. The rail prevents the table saw from sliding forward. After doing this, I realized I could have cut a hole in the base top for the saw dust to fall through. I might do this if I decide the saw does need to be bolted down, but so far I don't see the need. I even cut four 2x4 pads and glued them to the base's feet. Because the liner is fairly cushy, it ensures that the base is solidly gripping the floor with all four legs, making it feel really steady. It's practically impossible to slide the base on the floor, with the grippy stuff on the feet. 'Solid', 'Steady', and 'Table saw' are three words that really go together well. Next time, I'll show you why I need such a set up, but for now, Happy New Year! As the recipient of one, I loved your "secret Project" Christmas gifts. Absolutely beautiful - and utilitarian. I'm so glad I'm your Mom. This simple yet sturdy table saw base is what I was looking for. I love your adjustable sawhorses. Where did you get them? This is exactly what I was looking for, simple, sturdy, and small. I love your adjustable sawhorses. Where did you get them? They are great, and feature in one of my next posts. I got them from my brother when he moved to FL. Don't know where he found them. They are steel and quite stong. 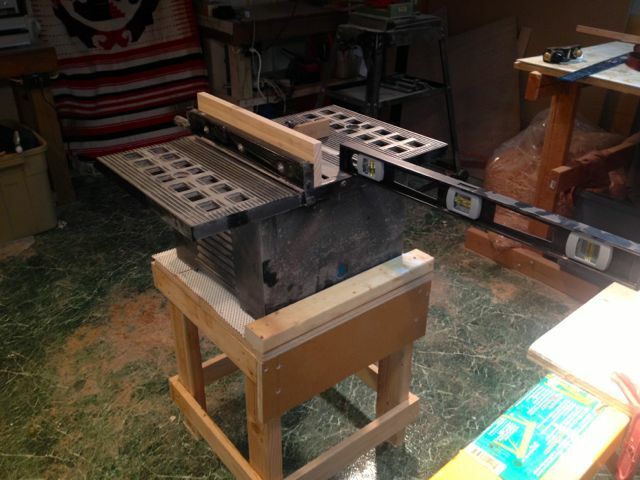 The best table saw is a nice to have on some projects and a must have for other projects. I use a table saw for nearly all of my curved cuts on materials thinner than 1 inch. Because the table saw goes to the material, it is perfect for cutting curves on large sheet goods. The bandsaw is limited because it can only work with materials that can be brought up to the saw and used on the table, but the table saw can work on any size material. It is a great started saw because it is less intimidating than other saws and it is light, portable and easy to use. This is spam I guess, but so well done I had to let it through. Bravo! Thanks for sharing your experiences. I found a lot of useful information there. I love wood working, too. I often use wood router and table saw for my project. They are the most essential tools for wood worker. Actually, I've since given up the table saw. I find it too loud, dusty and dangerous! Haven't missed it yet. Thanks for this tutorial! I will apply this technique in my work. I hope you posted about your top-secret Christmas presents after the season is over! I know how frustrating it is sometimes to work on something especially when it turned out great but you can't let anybody else know about it. Yup, this post was from Jan 1, so post-Christmas. It was great. I've since eliminated the tablesaw from my shop, though. Just don't find much use for it. Thanks for sharing, I'm shocked at how few of people use a feeder table... glad to see someone who does! I am thinking to buy a table saw for my next project. Dewalt is my first choice. Because of this safety and accuracy. I guess, you will be agree with me. Good call on building a stable stand for your saw. A table saw spinning out of control is no joke - very easy to get injured and i speak from experience here.